The XCMG QAY180 is a five axle all-terrain crane. QAY180 all terrain crane has two engines: superstructure engine and carrier engine. The specifically designed chassis combined with the eco-friendly engine greatly enhances overall driving performance. Specially imported cables and bearings inside the boom make for the most reliable configuration possible. Patented hydraulic system adopts many innovative technologies which can make the machine more energy saving and powerful. The new brake technique can reduce two thirds of your maintenance cost, and improve the travel safety. 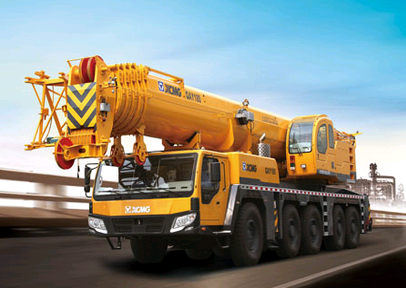 The counterweight technique developed by XCMG can effectively improve the lifting performance by 30%. The whole configuration includes 6-segment boom with the length of 62m and 3-segment jib with the length of 28m. 6 counterweight combinations can finish nearly 30000 working conditions. Get your XCMG QAY180 brochure! Are you interested in knowing more about the XCMG QAY180 all terrain cranes? Our brochure covers all the information you need.